In Speedway, Indiana, the Dale Sr, #3 bumper stickers are fresh and new. In Speedway, Indiana they rename the streets in the city center after our road racing heroes. In Speedway, Indiana when you are in riding gear, you are not looked at as a virus, but instead as a treasured guest, visiting their city. Speedway, Indiana is the home of the iconic Indianapolis Motor Speedway (IMS) and host to the 2010 Redbull MotoGP road racing series. This was the 11th of 18 races, and the second US round, the first being Laguna Seca, California. 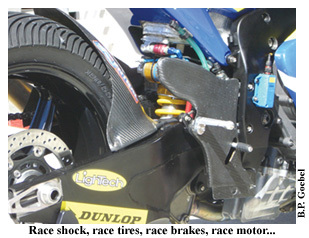 MotoGP bikes are 340lb, 230-plus horsepower machines that easily top 200mph. The riders are all at such a high level that a few tenths of a second difference in lap time can easily separate half a dozen different riders. This series is universally considered to be the highest level of competition for both riders and constructors. The 2007 attempt to reduce speeds by switching to 800cc bikes has not really worked. Overall lap times are actually faster than those turned in by the former fire-breathing 990cc machines. Riders coming to grip with the best way to ride their computerized, traction-controlled bikes have largely contributed to the newfound speed. World economic strain has finally reared its head in the rarefied, cost-is-no-object world of MotoGP. In addition to only getting a limited amount of Bridgestone spec tires to reduce costs, all teams are limited to cost reducing, six engines per season, per rider. 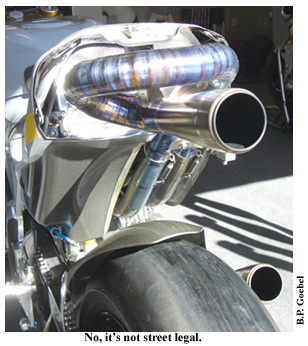 Every second that a MotoGP engine is running, it is also consuming itself. To further reduce costs, they have also eliminated Thursday practice. Practice is limited to Friday, with qualifying on Saturday and the race on Sunday. 2010 is the inaugural year of the Moto2 600cc 4-stroke class. This class replaces the 250cc 2-stroke “feeder class” that prepared riders for the premier class. The environmentally incorrect, (but mechanically so light and right and pure) 2-strokes have been sent to sea, ending a 60-year run starting with the 1949 championship. The Moto2 class was created with a controlling eye on costs and selling vicariously on Monday. The prototype machines run a 140hp, 600cc, inline four-cylinder spec motor manufactured by Honda and spec tires supplied by Dunlop. The teams are allowed to run whichever custom frame they choose. The machines are very closely matched. Unlike the premier 800cc class, the Moto2 class has no problems filling the grid. More than 40 bikes are running at once. First lap, first corner crashes have been as common, as in their distant dirt cousin, SuperCross. The 125cc 2-strokes in the super feeder class are also at risk due to environmental and cost reasons. Racing against them are the “greener” 250cc 4-stroke, single-cylinder Moriwaki Hondas. This class is tentatively being called Moto3. After a year of bad luck and injuries, World favorite Valentino Rossi is out of contention for the championship. His Yamaha teammate Jorge Lorenzo is currently leading in points. Kentuckian and 2006 MotoGP World Champion, Nicky Hayden is finally getting his Ducati to perform, and is starting to make the podium. Big news this year is AMA Superbike Champion and MotoGP rookie, Texan Ben Spies. In his first year on the bikes and first year learning the tracks he is starting to be dominant force in MotoGP. He claimed his first MotoGP pole position at IMS in front of a super excited home country crowd. Indianapolis Motor Speedway contracted to host the series for three years, 2010 being the last year. IMS recently announced that they will again host the series in 2011. This means that you have one more chance to see the trickest bikes on the planet being ridden by the most skilled riders in the world at one of the most accessible, historic race venues in existence. As we go to press, the 2010 season has ended, and many interesting turns of events have unfolded in the world of MotoGP. The biggest news is that Valentino Rossi, arguably the best Italian road racer in history (or racer period) has jumped bikes and is no longer paired with Jorge Lorenzo and riding for Yamaha, but is riding for the most famous of all Italian manufacturers, Ducati. This match has been discussed, dramatized and dreamed about for many years: an Italian rider on an Italian bike. After Rossi moved from the dominating Honda factory team to the lowly Yamaha factory team, many thought that he would no longer be a force to be reckoned with. Unfortunately for his completion, not only is Rossi one of the best riders in the world, he is also one of the best development riders in the world. 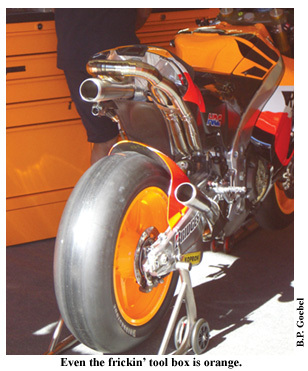 It is Rossi who developed the bike that his teammate Jorge Lorenzo used to capture the 2010 MotoGP World Championship. Latest news is that not only does Rossi, et al know why the Ducati factory bike was mostly unrideable by anyone other than World Champion Casey Stoner, but that they will be battling for the 2011 MotoGP championship from the first race. Casey Stoner has vacated the Ducati seat that Valentino now fills, and has moved to the factory Honda team. Within two days on the bike, he was turning some of the fastest times in pre-season testing. Casey is apparently done with “character” and will presumably be enjoying the benefits of “soulless engineering” in 2011. Newly crowned, 2010 MotoGP world champion Jorge Lorenzo will be the man to beat in 2011. He dominated the 2010 season. Like Rossi in past years, he consistently and nonchalantly beat his rivals with such crushing victories that one has to wonder if he is destined for greatness in the annals of Grand Prix history. If this wasn’t enough to make you order tickets for MotoGP Indy 2011 tomorrow, there is one more factor that will make next year amazing. Ben Spies. No longer is American Ben Spies riding second tier, satellite team machinery. With his stunning rookie season performance he has been rewarded with a factory Yamaha ride. He will ride the same bike as the current world champion. Nobody expects the inter-team competition to be any less extreme than the epic battles that Spies had with strong as titanium nails, Mat Mladin in their AMA Superbike years with Suzuki. Spies is fit. He is mentally prepared. Now, he is on top-level equipment, knows all the tracks and has data on them. In his methodical style, he will be a force to be reckoned with. On any given day, any of the four champions has the rare synergistic combination of skills, mettle and machinery that make up “the complete package”. Any of them could be the day’s winner. The 2011 MotoGP season should be a roller coaster. And it’s still only a day away.